Preheat oven to 375°. Spray 9-inch square baking dish with cooking spray; add Veggie Noodles, oil and salt and toss to combine. Cover dish with foil; bake 30 minutes. In large skillet, cook turkey and pepper over medium-high heat 8 minutes or until browned, breaking up meat with side of spoon; stir in salsa and seasoning. Heat to a boil; reduce heat to medium-low and simmer 3 minutes or until slightly thickened, stirring occasionally. Remove from heat; fold in 1 cup cheese. Toss turkey mixture with Veggie Noodle mixture; sprinkle with remaining 1 cup cheese. Bake, uncovered, 15 minutes or until top is browned. Let stand 5 minutes; serve sprinkled with onions and cilantro. 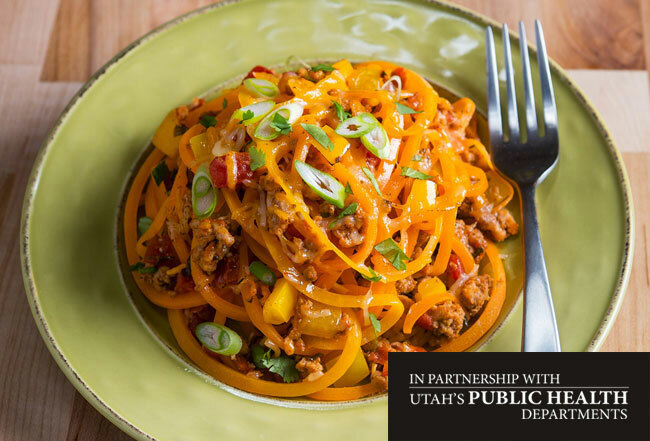 The butternut noodles are an excellent source of vitamins A and C and lower in carbohydrate and calories than most pasta. This recipe contains 873mg sodium and 14g fat (51% of total calories) and 6g saturated fat (22% of total calories) per serving. The Dietary Guidelines for Americans recommend limiting daily sodium intake to 2300mg and saturated fat to no more than 10% of total daily calories. Limit sodium and saturated fats in other daily meals as part of a balanced approach to a healthy diet. Consider serving with a carbohydrate-based side or using this dish to balance higher carbohydrate meals in order to manage carbohydrate intake to about 60-70% of your daily caloric intake.